New technology comes out daily; the key for every company is to determine when exactly to start using it. Are you on the bleeding edge, the leading edge, or are you a cautious adopter? Depending on the needs of the company and the technology, any one of those choices may be the right one. How do you decide which way to go? 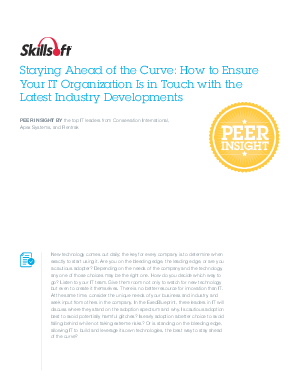 Read this white paper to learn how to ensure your IT organization is in touch with the latest industry developments.